Went for a walk down to Padworth Lock last week for the first time in well over a month and they've both gone - anyone know where? Many thanks all, will give it a go! To be honest I wouldn't know what to do with a windlass so wouldn't want to get too technically involved. Volunteer lock keeper had crossed my mind but unfortunately i'm fairly busy, most weekends i'm away and when i'm at home i'm often writing so probably wouldn't manage much more than a few hours spread across several late evenings a week! 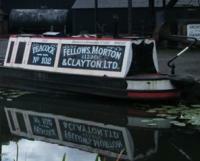 Won't there be repairs dating from WW2 present, or recently present, on Kildare from when it and the three other FMC boats were bombed at New Warwick Wharf in 1940?